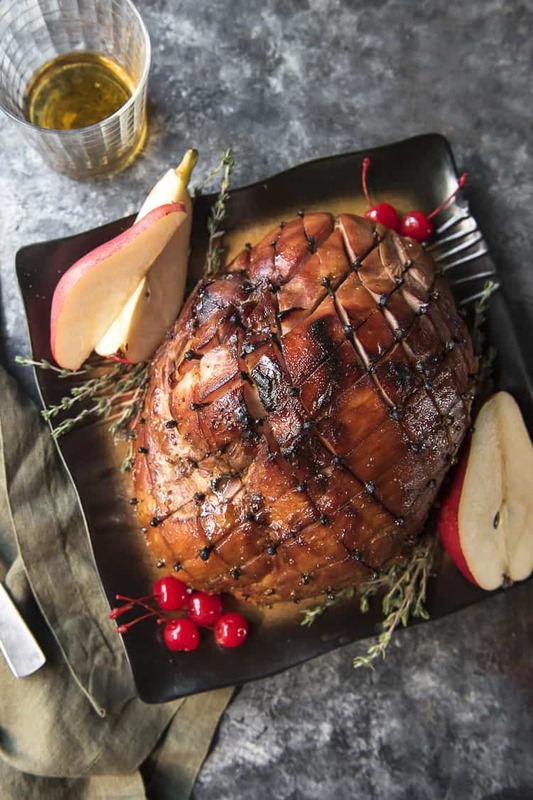 This holiday season you can have normal ham – or you can have Bourbon Honey Baked Ham instead! Sweet and smoky, studded with cloves, and broiled for that delightfully crispy skin, this is one unforgettable main course. I remember the days when it was mid-December before I put up my Christmas tree. Of course, that was just last year. This year is a totally different story. There’s a study going around that states that people who put up their holiday decor early are generally happier. At first I rolled my eyes at the thought. As I sat on the idea, I started to think about how much happier I myself am when I’m gazing at the sparkling lights and colored decorations. So here we are, mid-November and I’m already Christmas-ed up. JUST TAKE ME TO THE BOURBON HONEY BAKED HAM ALREADY! If you’d rather skip my (pretty darn helpful) tips and tricks, essential cooking info, and similar recipe ideas – and get straight to this deliciously easy baked ham recipe, just scroll right on down to the bottom of the page where you can find the printable recipe card! The bourbon will help with that, too. I don’t know when this bourbon kick of mine started, but I know I’m not ready to move past it quite yet. Between cocktails and desserts, it’s been heavily featured on the blog in the past year or so. 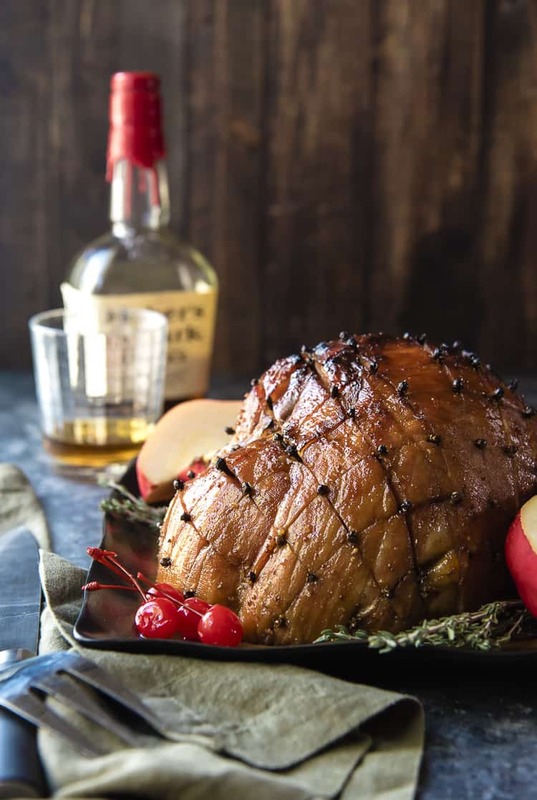 This baked ham recipe practically begged for an addition of that ol’ Kentucky whisky. 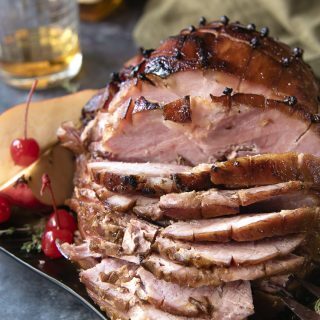 A juicy, deliciously comforting smoked spiral ham coated in a sticky brown sugar-honey-bourbon butter glaze is exactly what you need on your holiday table! 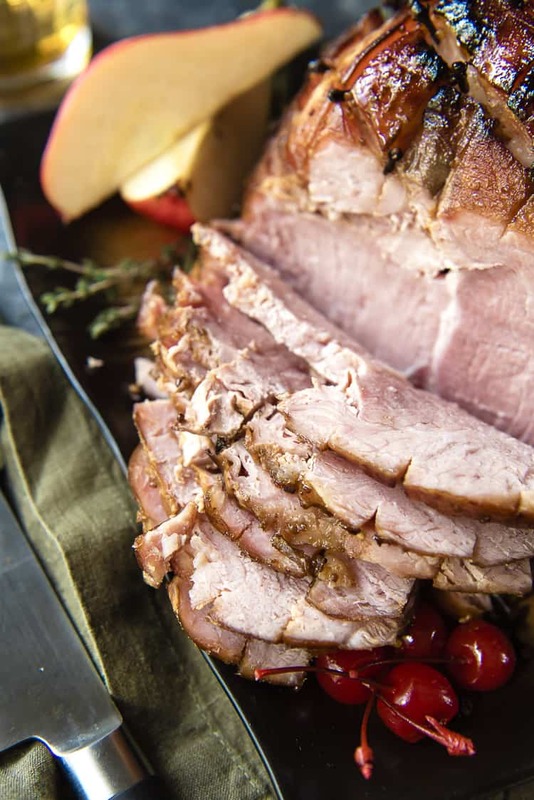 We eat our holiday meals pretty traditionally in our family – meaning turkey in November, ham in December. This baby is so good though, our Thanksgiving table might just have to share some space for a pile of sweet slices. How Long Do You Bake A Ham In The Oven? Both whole and half hams take about 18-20 minutes per pound at 325 degrees F. Always cover your ham with foil and bake it on a roasting pan set over at least 1 cup of water to keep it from drying out. To further avoid drying, cook the ham only until it reaches between 135-140 degrees F, then remove it from the oven. Safe ham temperature is 145, and it will continue cooking for several minutes even after it’s come out of the heat. If you’re broiling for crispy caramelized skin, aim for 130 degrees before cranking up the heat. Allow the ham to rest for 15-20 minutes before carving and eating, to allow the juices to absorb back into the meat. Can I Cook This Ham In My Slow Cooker? Sure can! If you need oven space for other main dishes or sides, your slow cooker can handle this ham recipe like a champ! 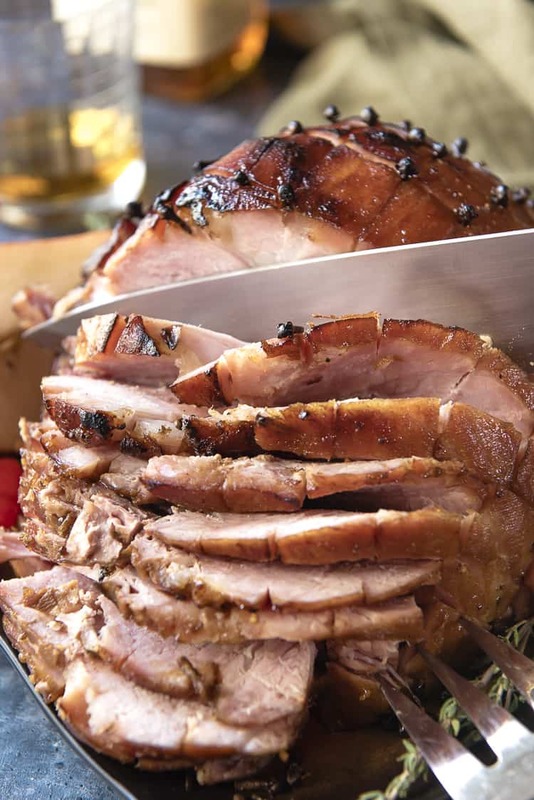 Trim your ham if it’s too tall to fit in your cooker, then place it in on its side. Pour half of the bourbon glaze over the ham and cook on low for 4-5 hours, until warmed through. Preheat oven broiler to High. Transfer ham to a roasting pan and brush remaining glaze over it. Broil for 4-5 minutes until browned and caramelized, but not burned. Preheat the oven to 325 degrees F. Pour 1 cup of water into the base of a roasting pan, then set the rack on top. Tent the ham with foil, wrapping it around the edges of the pan to keep the steam in. Bake the ham for 20 minutes. During that first 20 minute interval, make your bourbon ham glaze. In a medium saucepan set over medium-high heat, combine honey, brown sugar, bourbon, and butter. Bring the mixture to a boil for about 2 minutes, then remove from heat. When the first 20 minutes is up, remove the foil from the ham and baste it with some of the glaze. Return the foil tent and bake the ham for a total of 18-20 minutes per pound (approximately 2 hours for a 6-pound ham). Every 20-30 minutes, baste the ham with more glaze, always returning the foil tent to its place. 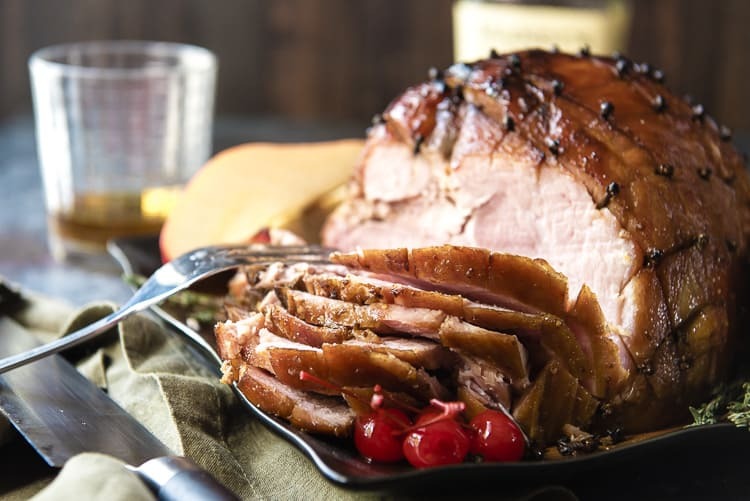 When the internal temperature of the ham reaches 130 degrees, remove the foil tent, brush the ham with the remaining glaze, and turn the oven to high broil. Broil for 3-5 minutes until the outside glaze caramelizes but is not burnt. Remove the ham from the oven and check the internal temperature, removing it when it reaches between 135-140 degrees (the temp will continue to climb from the residual heat). Return the foil to the ham and allow it to rest for at least 15-20 minutes before carving and serving. LOOKING FOR MORE HOLIDAY DINNER RECIPES? 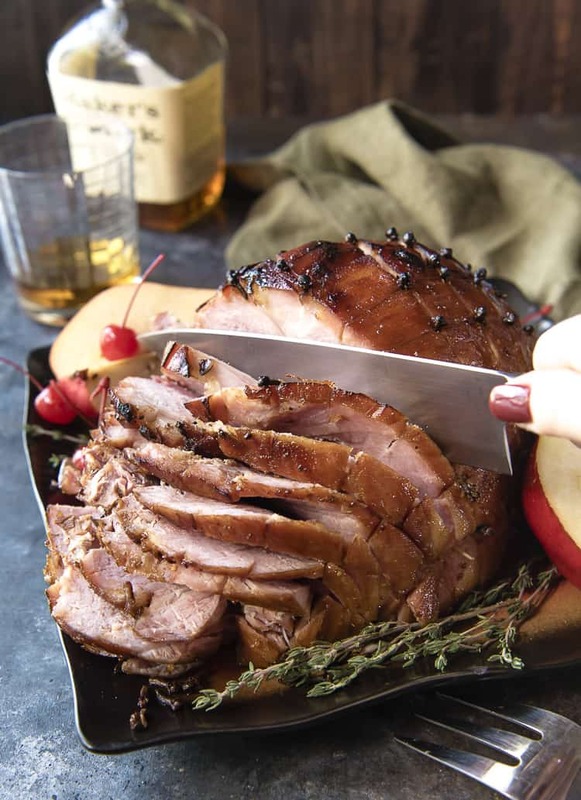 This holiday season you can have normal ham - or you can have Bourbon Honey Baked Ham instead! Sweet and smoky, studded with cloves, and broiled for that delightfully crispy skin, this is one unforgettable main course. Trim ham if it's too tall to fit in your cooker, then place it in on its side. Pour half of the bourbon glaze over the ham and cook on low for 4-5 hours, until warmed through. 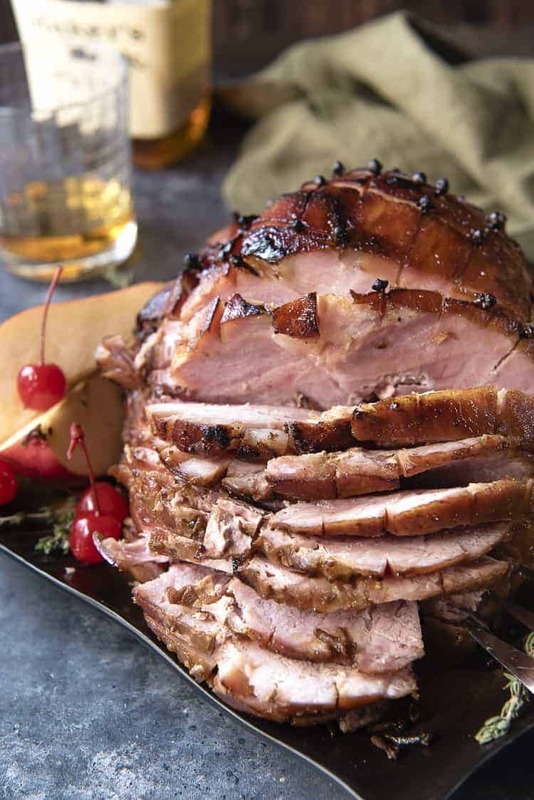 PIN THIS BOURBON HONEY BAKED HAM FOR LATER!